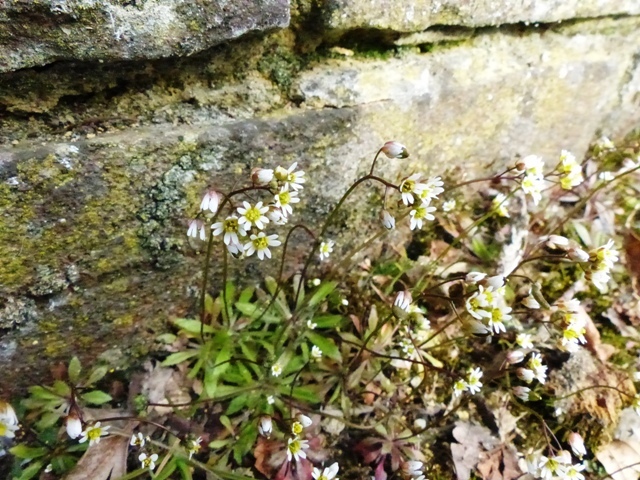 One of the first botanical signs of Spring is the aptly named Spring Whitlow Grass (Erophila verna) (except it is NOT a grass, not even remotely!). It’s a very common plant in urban habitats such as pavements, the base of walls and bare disturbed ground but it can be so tiny you might miss it! Get up close and you meet a very pretty little plant with its 4 tiny white petals forming a cross-shape. This is a give-away feature of the Cabbage family – Brassicaceae. However the petals are (unusually for Brassicaceae) notched and this probably explains why many students plump for Caryophyllaceae (the Pink family) without thinking as Caryophyllaceae has white flowers and often notched petals (think Chickweed, Stitchworts, Mouse-ears, Campions etc) but Caryophyllaceae has 5 petals NOT 4! So if those students would do as Dr M tells them so often and just listen to the plant, the 4-petals in a cross would shout BRASSICACEAE!